Liberia's president has inaugurated a Truth and Reconciliation Commission to investigate human rights abuses during 24 years of civil war and unrest. The seven-member commission does not have the power to try cases but will investigate crimes committed between 1979 and 2003, when civil war ended. 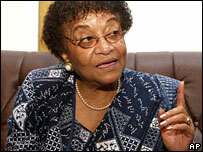 President Ellen Johnson-Sirleaf said Liberia had to face up to its past. During her election campaign last year, she had said she would not push for the war crimes court which some demanded. But launching the TRC, she said to loud applause: "In my own life I have come to believe that when the truth is told, humanity is redeemed from the cowardice claws of violence." Will you give the poor, powerless and deprived an opportunity to be heard? She adeed that the body would investigate "gross human rights violations and violations of international laws... including massacres, sexual violations, murders, extra-judicial killings and economic crimes". The TRC's chairman, human rights lawyer Jerome Verdier, said the commission would "give voice to the dead... in a society polarised by long years of war." Former President Charles Taylor is in exile in Nigeria, which is under pressure to extradite him to Sierra Leone to face trial for alleged war crimes in that country's civil war, which had close links to the Liberian conflict. Mr Taylor began Liberia's civil war by launching a rebellion in 1989, but human rights abuses were committed by all of the many armed factions which emerged during the conflict. Last month, Mrs Johnson-Sirleaf said bringing Mr Taylor to justice was not a priority for her country, which was seeking to rebuild after the conflict. Nigeria's President Olusegun Obasanjo has said Mr Taylor will only be handed over to an elected government in Liberia. Other former warlords took part in last year's elections but they generally received few votes.